Minecraft is fun for all. Over the past few years I have spent countless hours building and creating fantastic projects with some of my fellow staff members. No matter how much I game or the next big title hits the shelf, I still find myself venturing back to Minecraft. The endless game is like cracking open that box of new Legos, you just can’t wait to start building. Finally, the wait is over, Minecraft: Story Mode is here! This review is based on my experience playing the Xbox One. Developed by Telltale Games and Mojang, Telltale publishes another beautiful game called, Minecraft: Story Mode. The title is based on the survival video game Minecraft, which is an ongoing episodic point-and-click graphic adventure. During the journey, the player will have the ability to make decisions effecting the emotions of Jesse’s friends and encounters. The Minecraft: Story Mode is great to see after so many years of strictly building. For the purposes of this review, I will update the article as each episode is released along with my overall score. The game kicks off with Jesse and his faithful pet pig preparing to attend the annual “Endercon” event. Jesse and his Minecraft building friends plan on winning the contest, but several obstacles stand in their way. Along his path, Jesse is taken for a ride with a mysterious stranger getting himself caught up in a battle of evil beyond his imagination. Jesse and his friends must seek out the Order of the Stone to set things right. The gamer is led on a journey of surprises with twist and turns. Episode 1 is packed with everything you’d expect to see in a Minecraft game. The Order of the Stone is a bit far fetch for an average Joe such as, Jesse. But with an open imagination you will find yourself amerced in the story. 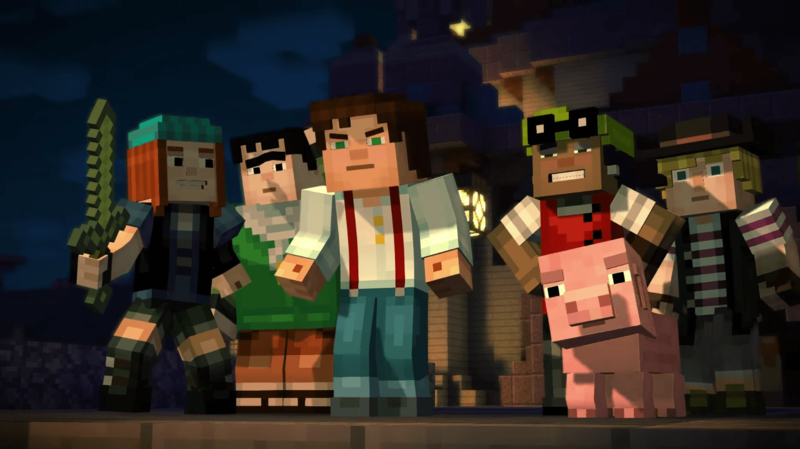 Minecraft: Story Mode – Order of the Stone is worth the $4.99 purchase. It will give you a breathe of fresh air from playing your daily Minecraft. Only time will tell is the other releases will be just as entertaining.